In the heat of midsummer, it's embarrassing enough to find sweat stains out in public - but when it starts to happen throughout the year, anxiety about personal body odors can really distract from everyday life. Thankfully, there are many ways to deal with the problem without spending tons on prescription-strength solutions. Read on to discover six things you can do to prevent underarm body odor and return to life as normal. Body chemistry is completely unique from person to person, so it's only logical that the same deodorant won't work for everyone. Many women find it helpful to try out several different brands and types of antiperspirant to find the right protection against underarm body odor. Many stores sell travel sizes of the most popular varieties, so test runs are simple and inexpensive. Underarm body odor is often unrelated to hygienic habits, especially for women going through menopause. Changes in diet help with body odor, and eating foods that are rich in zinc and magnesium might be a good first step. These minerals work to keep unpleasant smells at bay and can be found in leafy greens, nuts, seeds, and oysters. Cutting down on red meat and spices like garlic is also beneficial, since these foods affect not only breath, but also body odor. Sweating can be caused by both internal and external factors, which is helpful to remember if you are combating underarm body odor. Stress and anxiety can easily ruin sleeping patterns and many worsen menopausal symptoms, both of which can aggravate underarm odor, both in frequency and intensity. Yoga and deep-breathing exercises are great ways to quiet the mind and find inner peace. Just as adding healthier foods to the diet can help, eliminating poor nutritional choices can also have a positive impact. Cigarettes, alcohol, and coffee come are detrimental to the body in various ways, but their odors can seep through the skin and be magnified via the sweat glands. Underarm body odor is thus particularly affected, as that area of the body packs a high concentration of these glands and radiates aroma accordingly. Weight gain has been proven to contribute to body odor, which can pose a problem for women later in life who experience it as a symptom of menopause. This problem may also lead to an increased risk of diabetes, which carries unwanted scents as a potential side effect, as well. 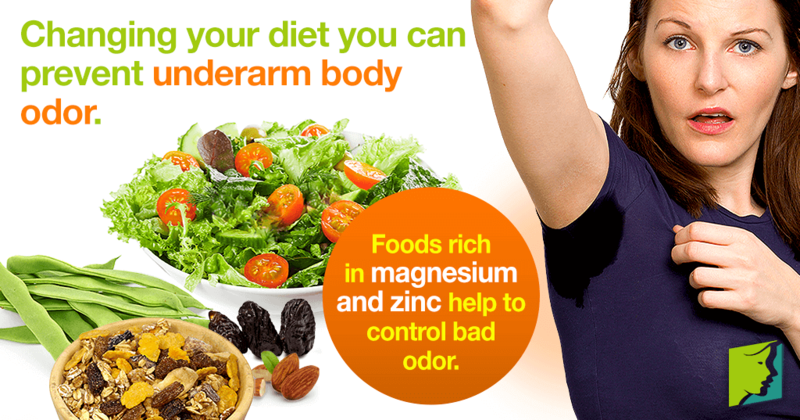 By way of maintenance, regular exercise and a balanced diet can prevent underarm body odor at the source. Depending on one's stage of life, underarm body odor might be caused by a larger condition that lifestyle changes alone cannot fix. Menopause and diabetes can result in excess sweating, as can some medications that are prescribed to treat them. Natural herbal supplements like Macafem or a change in prescription dosage might resolve it, so it's recommended to consult a medical professional if symptoms persist. Underarm body odor is never agreeable, but is certainly treatable. Whether by eating more spinach or finding yoga on YouTube, try out the tips listed above and make a plan with a health care professional to find relief today. When the fear of raising your arms subsides, you'll be glad you did. Read about home remedies for body odor. Havlicek J. & Lenochova P. (2006). The effect of meat consumption on body odor attractiveness. Chemical Senses and Flavour Journal Oct;31(8), 747-752.